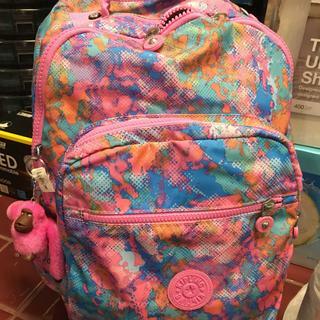 https://www.kipling-usa.com/seoul-go-large-printed-laptop-15%22-backpack/100266717.html Seoul Go Large Printed Laptop 15" Backpack Our best-selling backpack is equipped with everything you need to go back to school in style. Adorned in our signature crinkle nylon, the Seoul Large Laptop Backpack is a lightweight, durable, and water-resistant backpack that is both stylish and functional. Padded shoulder straps make it easy to carry heavy books, textbooks, and your 15" laptop from class to class or even across campus! Inside its roomy interior, there are endless zip compartments and slip pockets to help keep you organized. Thank you very much! Amazing product, very good quality with stunning colors. My daughter is very happy with her new backpack. My daughter choice: nice colored theme and required size. Colour and quality looks very good.